Gain 1 life whenever one of opponent's artifacts becomes tapped, or whenever the activation cost of one of opponent's artifacts is paid. Is not triggered by continuous artifacts. 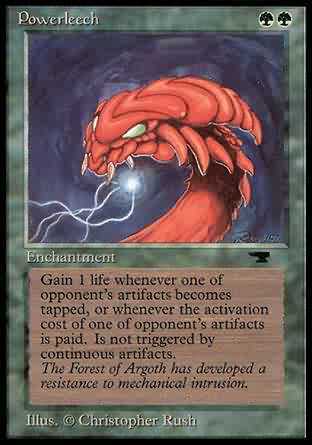 Whenever an artifact an opponent controls becomes tapped or an opponent plays an artifact's activated ability without T in its activation cost, you gain 1 life.